Rhubarb recipes, especially recipes like this wonderful strawberry rhubarb crisp, are a sure sign of spring. Each of these fruits is delicious on its own, combine them and it’s heaven on a plate. Serve this strawberry rhubarb crisp with homemade vanilla ice cream for a real treat. 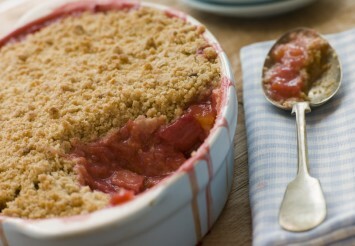 Mix rhubarb and strawberry pieces in a long baking dish (about 7 1/2" x 11 1/2"). Add cornstarch and sugar and mix well. Mix together the flour, brown sugar, orange zest and nutmeg. With a pastry cutter or knife, cut butter into the flour mixture until it is crumbly. Sprinkle fruit mixture with the topping and bake for 35 minutes or until it is bubbling and topping is golden. This recipe is a wonderful mix of sweet and tart, with a sweet, slightly crunchy topping. Both strawberry recipes and rhubarb recipes are popular in spring and summer when they are fresh and at their best. This recipe can also be made with frozen fruit too. Just thaw the fruit first and drain off some of the liquid. Or use it frozen, increase the amount of flour you use to thicken the filling and cook it for a few minutes longer to compensate for the cold fruit mixture. Find more rhubarb recipes in our easy dessert recipes collection here.